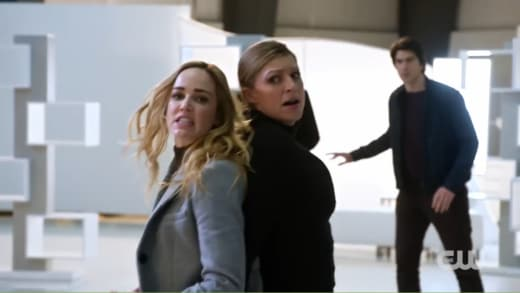 We have below the Legends of Tomorrow Season 4 trailer. In it we find a lot of hippy wear, some good lovin' between Sara and Ava (new series regular Jes Macallan), and a whole lot of shirtless Constantine (Matt Ryan). I'll leave the rest of the story to the official synopsis from The CW. After defeating the demon Mallus by cuddling him to death with a giant stuffed animal named Beebo, the Legends are ready to ease off the gas. Sara (Caity Lotz) and her team join Ava Sharpe (Jes Macallan) and the Time Bureau to help clean up the last few remaining anachronisms. The job seems straightforward enough until Constantine (Matt Ryan) arrives to inform them that, in solving one major problem, they have created another, much larger one. When the Legends let time crumble in order to release and defeat Mallus, the barrier between worlds softened. History is now infected with “Fugitives” – magical creatures from myths, fairytales, and legends. Having been expelled throughout time by people like Constantine, these Fugitives are now returning to our world in droves and making a real mess of things. As the Time Bureau is distrustful of and ill-equipped to deal with magic, the Legends must team up with everyone’s favorite demonologist to set history back on track. 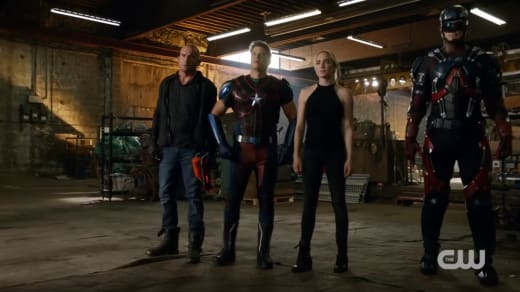 Sara and Constantine are joined by compassionate inventor Ray Palmer (Brandon Routh), hotheaded ex-con Mick Rory (Dominic Purcell), rebellious totem-bearer Zari (Tala Ashe), and heartbroken historian-turned-superhero Nate (Nick Zano) as they set out to save the world – and their legacy. It’s the familiar fun of the Legends time-travelling across historical events and encountering famous figures with an added shot of magical craziness! Based on the characters from DC, DC’S LEGENDS OF TOMORROW is from Bonanza Productions Inc. in association with Berlanti Productions and Warner Bros. Television, with executive producers Greg Berlanti, Phil Klemmer, and Sarah Schechter. The best news of this explosive trailer? The humor is more on point than ever, and that's what makes Legends the best of the DC shows on The CW. They don't take themselves so seriously that when a story fails it tanks the entire season. Bravo!! Make sure you watch DC's Legends of Tomorrow online for all the best bits until its return!